Sacramento is a diverse food city, with lots of different dining options depending on the neighborhood. Downtown there are plenty of trendy farm-to-fork restaurants where you can rub shoulders with well-suited government workers or head to Midtown and find places like a family-owned Japanese market that sells homemade mochi and doubles as the go-to shaved ice stop during the summer months. As a proud resident of the Sacramento Area for almost a year (! ), here are some of my favorite go-to spots around town. Located nearby Sacramento International Airport, this is a great spot to pick up bagels if you’re in the area. The bagels have the perfect amount of chew and there’s a wide selection of flavors as well as cream cheese options and sandwich fixings. Make sure to get there early, since they tend to sell out quickly. If I lived nearby, this would be my go-to coffee shop for when I got stir-crazy working at home. There are plenty of fantastic breakfast options, as well as sandwiches and salads. I got the smoked salmon on a pretzel bun, and couldn’t have been happier. This café is housed in a beautiful brick building, with a spacious outdoor patio for when the weather is ideal. There is also Old Soul Co., another branch of this local coffee chain, which is located in a warehouse and has a bit more indoor seating. This restaurant is a prime example of the farm-to-fork food trend that Sacramento is known for. Every thing I ordered tasted incredibly fresh, from the free-range eggs to the side of veggies that graced my plate. I went for brunch, but I hear their dinner isn’t too shabby either. Also, their lemon lavender mint tea was something else. Known for their healthy brunch options, this restaurant in East Sacramento serves up some seriously good pancakes and veggie scrambles. There are also Latin American flavors on the menu, like the Papas Loco and Breakfast Tamales. Get an extra side of the berry puree if you are craving something sweet and fruity to go on your homemade rosemary bread. The restaurant is located in a residential area, so parking is notoriously tricky. If you’re craving a solid sandwich, this Midtown deli is the place to go. First of all, it’s located in a beautiful residential area, and is on the first floor of a house that features a front porch that is perfect for warm afternoons. Order one of their signature sandwiches or order a classic one that features deli meats like turkey or roast beef. Whatever you do make sure to order the bomb sauce (spicy ranch). I’ve only been here for happy hour (3-6pm every day), but it was such a memorable experience that I would recommend it to anyone looking for drinks and small bites in the city. Mustafa and I ordered marinated olives and smoked almonds, as well as pickled veggies and everything was spot on. There’s also an extensive happy hour menu of beer, wine and cocktails. The space itself is very cozy with plenty of seating, including an outdoor patio and a lounge area. This is one of my favorite spots in town hands down. Their beer list is extensive, but they also excel in their food offerings. I’m a sucker for their hot buttered pretzel and their homemade bratwurst topped with dijon aioli. Their Pangaea burger is also worth mentioning, as well as their fried chicken sandwich. On Tuesdays-Thursdays (11am-5pm) there’s a $10 deal for a BBQ pork sandwich and a pizza port. On Sunday nights (5-9:30pm), you can get a fried chicken sandwich and a Modern Times beer for $15. Located in the trendy downtown neighborhood, this restaurant is the place to go for fresh seafood with a little kick. I ordered the Blackened Salmon and I’m not usually one to go for spicy food, but man was that salmon good. Happy hour, Monday 3-10pm, and Tuesday-Friday 3-6pm is definitely worth checking out for the steep discount on dishes and drinks. In Sacramento, there’s a sizable Japanese population and so it’s no surprise that this extremely popular ramen joint exists and it’s always packed. There are lots of different kinds of ramen options, whether you’re in the mood for spicy, savory or veggie. There’s even a chilled ramen version for those hot hot summer days. Sacramento has a lot of good sushi options, but this tiny restaurant in Midtown excels in inventive vegan choices. The Vegan Irishman with tempura yam and avocado, topped with seasoned brussels sprouts is not to be missed. Their happy hour all-day Tuesday, Wednesday-Saturday 3-6pm, and Sunday 5-10pm is great if you want to save a few bucks on drinks and rolls. 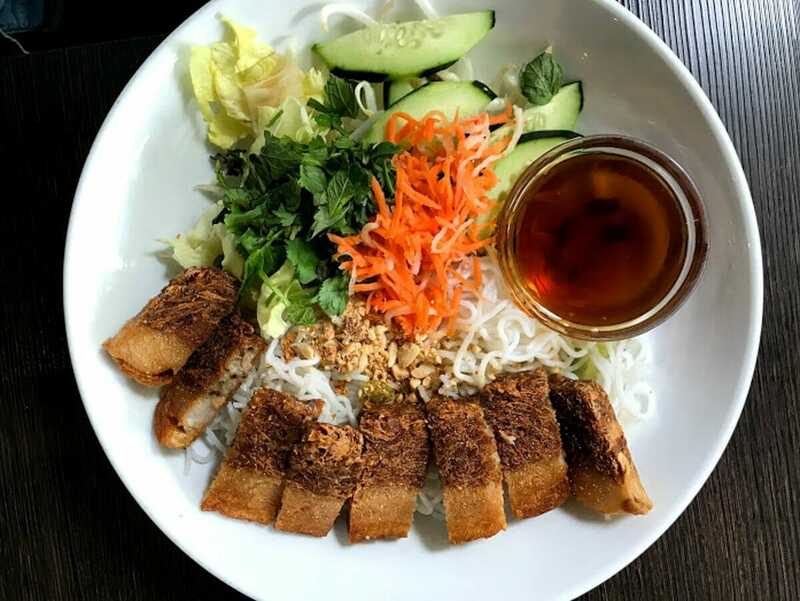 This family-run Vietnamese restaurant serves only vegan/vegetarian food, but they do it really well from their noodle soups to their spring rolls. The interior is very calming with a focus on Buddhism, and also features a remodeled kitchen area. There are also fresh fruits and veggies at the cashier that are for sale. This bakery is a great spot for gluten-free and dairy-free sweets. There are a wide variety of treats, from cupcakes to chewy chocolate crinkle cookies dusted in powdered sugar (my favorite). There are also hot breakfast sandwiches and regular sandwiches if you want a more substantial meal. This bakery has an impressive selection of both sweet and savory baked goods, from pies and cakes, to freshly baked bread and pretzels. It’s great spot to indulge in their decadent cakes, from their carrot to their strawberry champagne flavors. The bakery is located on a busy street, but there’s usually residential parking around the corner. There’s nothing better on a hot summer day than a real fruit freeze from this local institution that has been around since 1940. This spot is famous for their 50-50 where you get vanilla ice cream added to the center of your fruit freeze. You won’t miss the building, with its iconic neon sign of an ice cream server on the roof. Afterward, walk around the Curtis Park neighborhood and admire all the tree-lined streets and beautiful homes. This tiny Japanese market churns out homemade mochi every morning: red bean, white bean or peanut butter (didn’t try this one, but heard it’s very popular). They also have pre-package sushi and some Japanese snacks like those highly addictive wasabi peas. During the summertime, make sure to come for their popular snow cones. Have you been to Sacramento? Where are your favorite places to eat?